Anaplan is the leader in Connected Planning. Their purpose-built software—powered by their patented Hyperblock engine—enables dynamic, collaborative, and intelligent planning. Large and fast-growing companies worldwide use their solutions to connect the people and data required for trusted plans and accelerated decisions essential to leading in their markets. Based in San Francisco, they are a privately-held growth company with 20 offices and more than 850 customers worldwide. To learn more, visit anaplan.com. 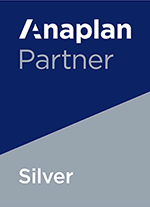 As an Anaplan Silver Partner we have been recognised by Anaplan for our established level of Anaplan experience and for offering customers consistent, reliable service quality. Silver Partners are required to meet training, CSAT and implementation requirements while also receiving access to an increased level of benefits.